Hang from your neck, clip to your belt or your boots, this knife is designed to be ready when you need it. 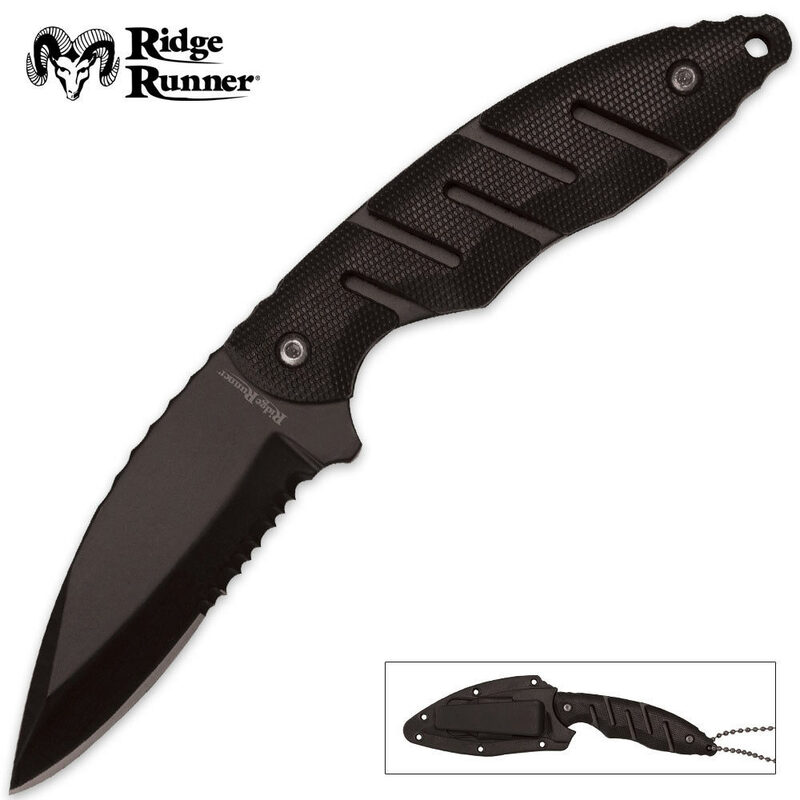 Features include a full tang construction, black-coated 3 in. stainless steel blade, and combo plain/serrated cutting edge. The textured handle is constructed of black ABS and cut for a secure grip. The hard ABS sheath holds the knife firmly in place and includes a neck chain for lightweight transport in addition to the clip. 6 5/8 in. overall. When I got the knife it had what almost looked like a flat grind on one side of the edge. I also noticed that the sheath holds the knife poorly and it will fall out if you're not careful with it. I do not recommend this as a neck knife but a belt knife instead because of the simple fact that if you wear it around your neck it will fall out of the sheath and possibly stab or cut you. This is a really neat little knife. It feels so natural in my hand. I carry it with me all the time. This knife is very well built and fits my hand better than any neck knife I've ever purchased in this price range. It needed a bit of sharpening, especially the recessed edges (what most people incorrectly call serrations? )where the black coating is over sprayed, but a small round/tapered file will clean this up. Great buy! great knife very well built. I cant believe this knife is ONLY 6 bucks... Full tang construction means super strong and no way to break it without doing something incredibly stupid. The sheath is great, holds well, and the removable/reversible clip is genius. Only complaint is that the necklace does not fit through the holes in the sheath but oh well, a drill and 5 seconds will fix that. For 6 bucks I am a very happy camper, this knife could be priced much higher and itd still be a deal. Much more weight than I expected. Good knife feels like it will last a while. Neck or boot it's going to be a staple. Great little knife! Came sharp out of the box. Very nice little sheath. Amazing grip! In a self defense situation, this knife is great! Pepper spray doesn't have an effect but boy does the blade. Had it sharpened with the edge of glory n it cuts thru everything like butter. Thank you for making this life saving knife.